Miyazaki Prefecture's Nakamura Hamono doesn't employ any sort of online presence to sell their products. You have to weave some search-fu magic to uncover even the occasional incidental blog post or festival report referencing the the company and their knives, and that's when you know who and what you're looking for. The lack of need on the seller's side has meant a lack of opportunity for those of us further afield. No more! How did we find them? Well, blacksmithing networks run deep. We were referred to Nakamura Hamono by master craftsmen we know whose connections with Nakamura san go back decades. Back to before he set up business in his home town of Miyakonojo in the seventies. We're glad we found him. 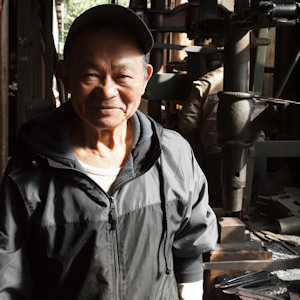 Nakamura san has worked in steel for over forty years. The business produces a variety of agricultural edge tools along with quality kitchen knives in Aogami#2 and HAP40 cutlery steels. Let the internet sales frenzy begin.